Achilles tendinopathy refers to irritation within the large tendon which joins the two largest calf muscles (gastrocnemius and soleus) to the heel bone (calcaneus). It was historically called Achilles tendinitis but tendinoapthy (or tendinosis) is now the accepted term. This is a common injury in sports involving running and jumping, and results primarily from an issue with the load that the tendon is exposed to. It is not exclusive to sport however, and can be caused by other activities. Some rheumatology conditions can also affect the Achilles tendon and a certain type of antibiotic (fluroquinolones) can also induce an Achilles tendinopathy. 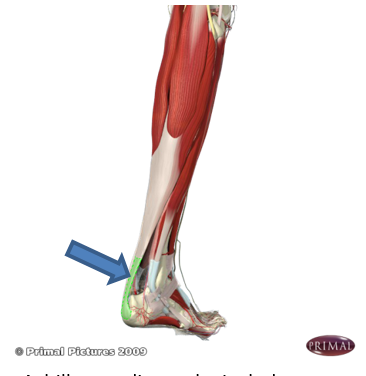 The function of the Achilles tendon is to transmit forces produced by the calf muscles to the heel bone. Changes in the activity of the calf muscles (i.e. doing along walk or run for the first time in a while), and therefore the Achilles tendon, can lead to changes within the substance of the tendon. While there is debate amongst experts, it is generally agreed that there is a chemical response within the tendon which may involve inflammatory cells. Although this response is initially part of the healing process, when the stresses are repeated, the chemical response is prolonged and so produces local tissue changes. Factors that may contribute to Achilles tendinopathy include a recent change in training (e.g. frequency, duration, intensity, training surfaces), reduced rest periods between training, reduced strength in the calf muscles, biomechanical abnormalities, poor footwear, and decreased muscle flexibility and joint range of motion. These factors can lead to increased stress on the Achilles tendon and subsequent tendionopathy. As mentioned above, certain medical issues may contribute to the development of Achilles tendinopathy too. Achilles tendinopathy results in pain within the tendon just above where it attaches to the heel bone. This pain typically develops gradually. Initially, the tendon may only be painful following exercise. For example, it may be first felt on rising the day following participation. Associated with the pain may be stiffness or tightness in the Achilles region. Typically, these initial signs of Achilles tendinopathy disappear quickly with walking about or after a warm bath. However, as you continue to participate, the tendinopathy progresses and the pain within the tendon becomes more intense and more frequent. For example, it may begin to be present during participation. In the early stages, this pain during participation may ease off as you warm up, only to return when you cool down. However, as you continue to participate, the tendinopathy worsens and your pain may begin to be present for longer periods during participation until it is present all of the time. This may interfere with your performance. Achilles tendinopathy generally doesn’t settle without making some form of change to your activity. Many people rest for a week or so, feel better and return to their activity only to experience symptoms again. It is common for this cycle to continue for a while and is referred to as ‘boom and bust’. If you have or suspect you have Achilles tendinopathy, and you are unable to break this cycle then you should consult a qualified professional (e.g. physiotherapist). If you suspect you have Achilles tendinopathy, you shouldn’t ignore the problem. Your pain may get better as you exercise; however, the exercise you are doing may be interfering with the healing process and causing further irritation. This can lead to your injury getting worse such that your pain does not ‘warm-up’ and you feel it throughout participation. If this occurs, your recovery may be prolonged and it may take a number of months for you to return to full participation. The assistance of a qualified professional is important in the treatment of Achilles tendinopathy. Initially, they can assist in the diagnosis of the problem and establishing associated factors. From their assessment, the clinician will determine an appropriate treatment plan. This may involve activity modification and a progressive strengthening program. Soft-tissue treatment such as massage may be used in the calf muscles but is generally not seen to be helpful when applied to the Achilles tendon itself. In presentations resistant to initial treatment, other options can be discussed such as high volume and hyaluronic acid (Ostenil Tendon) injections and shockwave therapy.